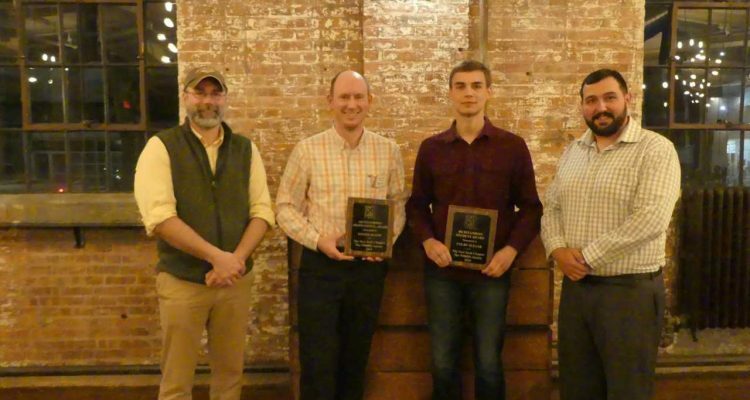 Last week, SUNY Cobleskill’s Dr. Roger Masse and nine students attended the New York State Chapter of the Wildlife (NYTWS) annual meeting, held in Kingston. Coby student Colby Slezak was in contention for the society’s annual Outstanding Student Award, after being nominated by Dr. Masse himself. According to Dr. Masse, it was no surprise when Slezak was announced as the award recipient. The surprise, he says, came later in the evening when Dr. Masse learned he has been selected the NYTWS Outstanding Professional of the year. SUNY Cobleskill’s growing acclaim as a NYTWS chapter includes a feature in the Spring 2019 edition of The Northeast Section of The Wildlife Society Newsletter, in which Slezak’s nature photography is displayed in prominence. Earlier this academic year, the College’s student-team placed in the top four of Quiz Bowl 2018 at the TWS national meeting, held in Cleveland. On behalf of SUNY Cobleskill, congratulations to Colby Slezak and Dr. Roger Masse for their achievements.